Okawachi ware. Okawachi is about three ri (about 11.5 kilometres) from Arita. At first the kiln was located at Iwayagawa next to Arita, where the Lords of Nabeshima ordered a kiln to be started during the Kyoho period (1716-1736). Later, for some reason, it moved to Okawachi and was attached directly to the feudal administration and used for the manufacture of high-quality goods for presentation to the shogun; it was forbidden to carry on private trade. Nevertheless there are pieces that were made on the orders of aristocratic families. Nabeshima bowls and plates have a vertical comb pattern on the foot [see 1 below]. More recent research has corrected some historical inaccuracies in Kurokawa's account. Although the early history of Nabeshima still has to be considered a matter more of variously believable oral tradition than of verfiable fact, it is now thought that between Iwayagama (correctly, Iwayagachi) and Okawachi the kiln was located for a time at Nagawara, where it is said to have been moved by Soeda Kizaemon, successor to Takahara Goroshichi, the supposed founder of the Nabeshima tradition. The archives of the Soeda family claim that the transfer to Okawachi tool place in 1675, a date that can be supported by shards excavated there. In a recent article, Yabe Yoshiaki of Tokyo National Museum has attempted to make the year 1690 the approximate dividing line between Ko-Nabeshima or Shoki-Nabeshima [old or early Nabeshima] and the mature wares of the later period, citing in support of this theory a Nabeshima family document of 1693 which orders that tsugomono [occasional pieces], thought to mean trade pieces, should be made in addition to items for presentation to the shogun and other daimyo [feudal lords]. Even if this theory is accepted as providing a starting-point for increased production and wide diffusion of the ware, it still leaves us with great difficulty in establishing a chronology for the great bulk of Nabeshima pieces that have survived until today. 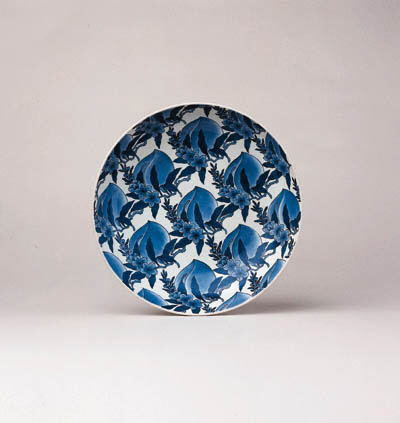 The peach motif is seen in two plates assigned by Yabe to his "periode d'apogée", 1690-1760 [see 3 below]. (Tokyo, 1878, 1888; reprinted Heibonsha, Tokyo, 1976), 158-9. 2 Yabe Yoshiaki, "Le Nabeshima polychrome, un emblème de l'esthétique japonaise", pp. 10-18 in the catalogue cited below. des Seigneurs de Nabeshima, (exhibition catalogue, 16 December 1997 - 14 February 1998, Espace des Arts Mitsukoshi Etoile; Paris, 1997). Please note that this lot is liable for 17.5 VAT on the hammer price and buyer's premium.